Transport yourself to the moonlit streets of Paris with this group of patterns that emanates the cool and collected style of the French. 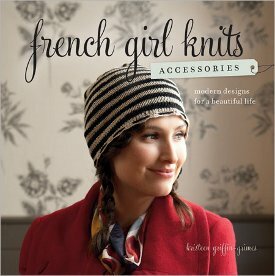 Following in the footsteps of the equally as elegant title French Girl Knits, this time author Kristeen Griffin-Grimes has narrowed in on one specific topic: accessories. From lacy socks and shrugs, to chic berets and fingerless gloves, French Girl Knits Accessories provides all the cold weather staples a girl could possibly need. But not every pattern in this charming collection is meant for warmth, others work hard to reflect a more genuine piece of our own personal style by including romantic accents and vintage-inspired shaping on each pattern. These fashionable patterns include light and airy designs for wraps, stoles and shrugs that are perfectly tailored to hug your body in all the right places, without ruining the ethereal quality of each design. With delicate, tailored wraps and feminine, cozy stockings this fantastic group of French-inspired patterns is just what your overseas-loving heart needs. Aside from being aesthetically exquisite, each project is small and transportable and comes with detailed step-by-step instructions.